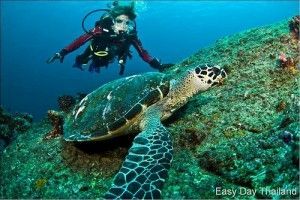 The Open Water course is the most popular learn to dive course in the World. In 3 days you can be qualified to dive independently. The course includes knowledge development, skills training in the pool and 4 open water dives. You can learn as part of a group or privately on a one to one basis. Courses are taught with the latest materials, new dive equipment, modern facilities and safe boats. A Scuba Diver card allows you to dive to a maximum depth of 12 metres under divemaster supervision. Group instruction or private instruction? Less time in the classroom. Fewer students means fewer questions, fewer quiz mistakes an so on. You get more time in the pool to practice each skill. Your instructor has to watch everyone complete each skill before he can move on to the next skill. With group courses you have to sit and watch while other students are practicing. With a private course you get to practice more yourself. There is less peer pressure. With a private course you go at your pace. No one can slow you down and you can’t slow anyone else down. Longer dives. On group courses most of the dive is spent practicing the skills of all students. On private courses the skills are completed quickly, then you can enjoy the marine life. You only surface when your own air runs low, not when someone else’s does. Your instructor can focus on making you a better diver. With fewer students to watch over your instructor can dedicate himself to you.